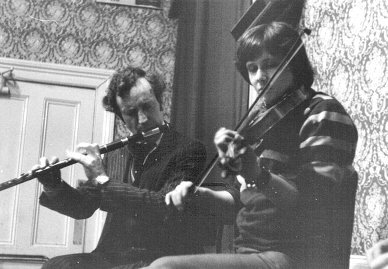 Live recordings of Irish traditional music sessions from the 1970s featuring Tommy McCarthy, Bobby Casey, Kevin Burke, PJ Crotty, Oliver Mulligan, John Joe Healy, Peggy Healy, Tommy McCarthy Jnr., Martin 'Junior' Crehan, PJ Crotty, Stevie O'Halloran, Joe Ryan, John Kelly, Jnr., John Kelly, Snr., Joe Ryan, Joe Rynne, Sean Keane, Kitty Hayes, Peter Laban, Paddy Galvin, JP Downes, JC Talty, Michael Falsey, Michael Sexton, Ita Crehan and Fergus McTeggart. 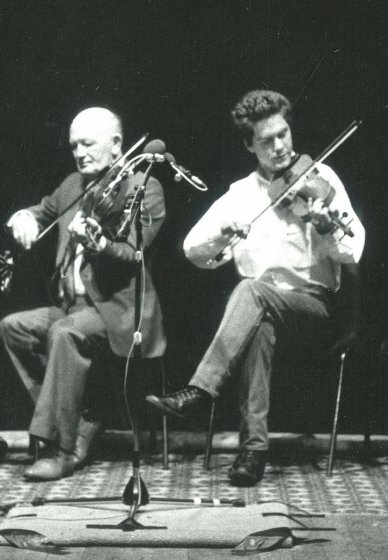 Sessions were recorded in London, Lahinch, Crosses of Annagh, Knocknahilla, Miltown Malbay and Dublin. 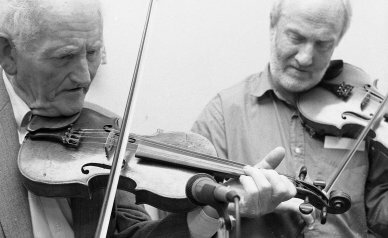 Clare County Library is grateful to Jim Carroll and Pat Mackenzie for donating material from their extensive collection of audio recordings of traditional music sessions featuring musicians from County Clare. We are also grateful to Peter Laban and Pat Mackenzie for allowing us to use photographs from their collections, and to Mary Custy and Paddy Comber for their help in identifying tunes. PJ Crotty and Paul Boyle, 1970s. Photo © Pat Mackenzie.